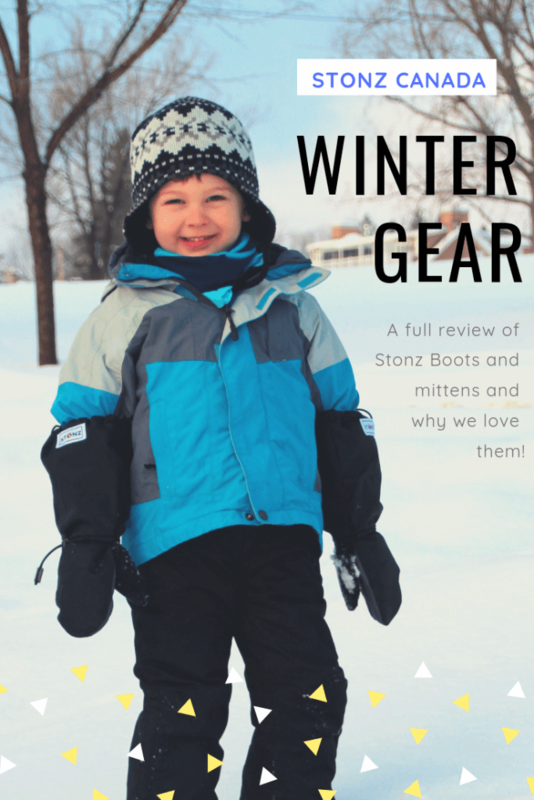 Check out our Stonz Mittens and Stonz Boots Review! 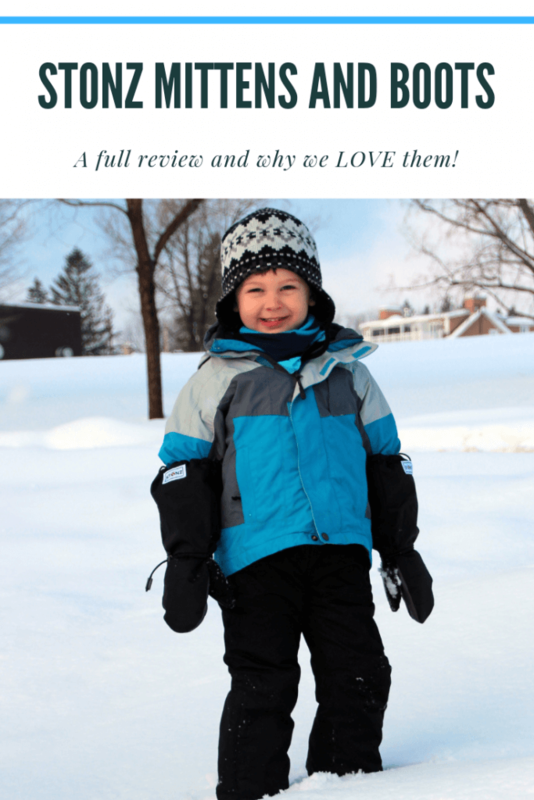 We found the canadian company Stonz over two years ago when I was looking for winter boots for my super active toddler. We were living in Germany and my son was on the waiting list for a coveted Waldkindi (forest preschool) spot in our local town in Germany. A fellow parent handed me the gear list and my eyes got wide! So much gear! Luckily, I knew that Stonz boots would be perfect because they are durable, lightweight and easy to take on and off. We purchased our first pair of toddler snow boots in the Winter of 2017 and haven’t looked back! After owning two pairs of Stonz boots, we were ready to check out their new Stonz mittens. Stonz is a family owned business run by Lisa Will that started in 2004 based on Vancouver, Canada. Lisa is an outdoor lover and wanted her kids to be able to experience the great outdoors without cold feet and gear that wasn’t practical for outdoor play. 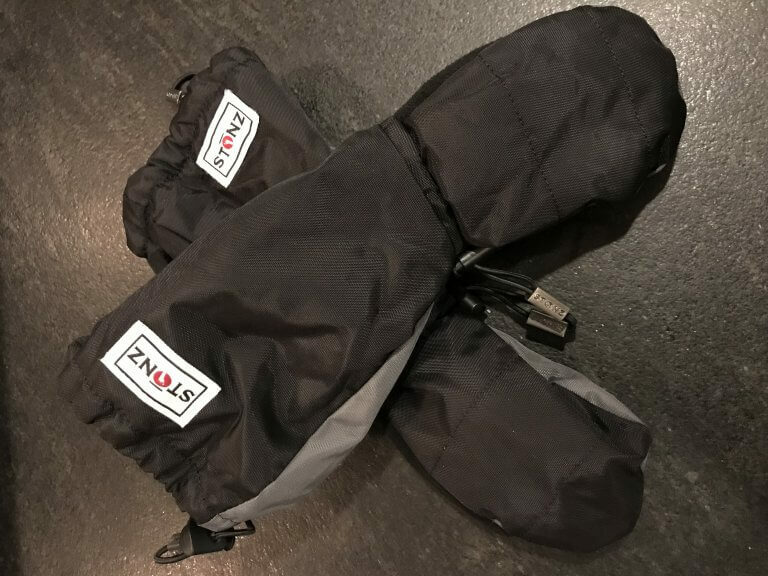 Stonz was born and she continues to expand the company with outdoor gear including footwear (snow and rain), accessories (like the fabulous snow mittens) and apparel. 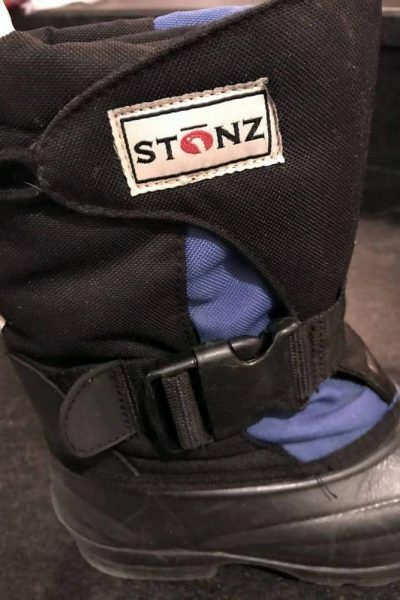 Stonz is one of the few companies to make infant snow boots and baby snow boots! We love how Stonz takes customer feedback into account, donates to local charities and makes footwear that stands the test of time! Be sure to join the Stonz community for 10% off your order! Let’s talk about snow mittens and kids! I don’t know about you, but we went through a few pairs of mittens before we finally figured out what works! My husband is from Alaska and we are huge outdoor lovers, so even from a young age, your son was being thrown into a carrier and trekked around the world. Did I mention we’ve been to over 20 countries? Including a trip to Lapland Finland in December to enjoy the Santa Claus Village. (Click the link to check out that blog post!) Then my son attended a waldkindi (forest preschool) for a year when we lived in Germany. He was outside 5 days per week for 3-4 hours a day, in ANY type of weather. I became a master at getting him all bundled up and ready to play outside. This wasn’t a 30 minute jaunt outside in the snow, this was building, using tools, rolling down snow hills and crossing frozen rivers. Mom and Dad weren’t around to constantly fiddle with and put the gloves back on. So with all that in mind, here we go, here is the full review of Stonz Mittens! We love that the mitts are 100% waterproof, this means that little hands stay dry and warm. There are two adjustable toggles, one by the wrist and another at the end of the mitt (to tighten near the elbow). There is added grip material on the palms to help children hold objects, like a beloved snow shovel or stick. The thumb also has fleecy material for the inevitability runny nose. In addition, there are clips at the end of the mitts to clip them together when not being warm. I always love the clips because it makes it so much easier to find the pairs after they’ve been stored over the summer. My son said that the gloves were very comfortable. 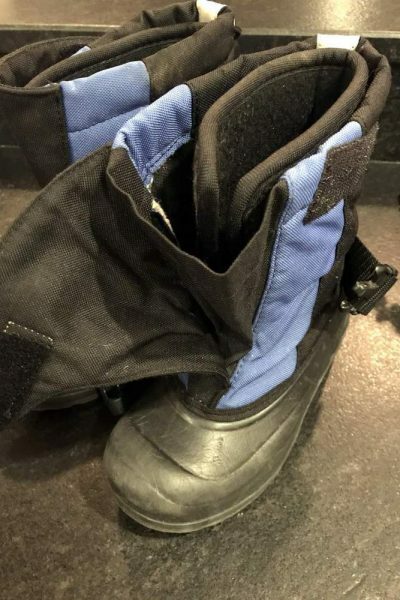 He wore them for countless hours while snow tubing in Canada and playing in the snow while in Quebec City during a family holiday. (Click to the link to read more about that trip). With the warm fleece lining, slide in thumb hole, fleece on the thumb (for a runny nose) and quick toggles, we found them easy to take on and off. My son’s hand were nice and warm even after multiple hours at freezing cold temperatures. We did email Lisa about the toggle design. Since my son is 4 years old, the toggle strings were quite long and could possibly catch on ski/tubing lifts. We came up with the solution to clip the bands to make them a bit shorter. I don’t think this would be an issue for older kids, since their hands would be larger and the toggle wouldn’t need to be so tight. We love the array of colors in both the Stonz Mittens and the Stonz Boots. The baby mitts come in four colors: black, grey, pink and blue. The youth Stonz mitts come in black with a grey accent, grey with a black accent, black with a pink accent and black with a blue accent. We love how they coordinate with the Stonz boots. The mitts are also easy to clean, which keeps them looking their best. We just wipe them down with a wet cloth and have notices that both the boots and mitts look excellent after weeks of nonstop use (in the forest preschool). The quality of materials is top notch. Stonz uses a 600D coated nylon shell insulated with 150g 3M Thinsulate. What does that mean? High quality materials that will not easily stain or rip. My son played out in the forest with sticks, hammers, garden tools and sleds. The mittens held up to all of the use and were able to be reused the following year. I feel like that says alot. Any parent of a boy can attest that most items cannot survive a single season with an active outdoor loving boy or girl. I have to say that Stonz Mittens hit the nail on the head. How much do the Stonz snow mittens cost? There are two different types of mittens. The Baby Mitts come in two sizes, 0-12 months and 12-24 months. They typically cost around $30, but if you purchased around January/February, you can get them on sale for around $15. You can also purchase the baby mitts on Amazon at the link below. Need some mitts right before Winter? Be sure to join the Stonz community and get 10% off your order. The Youth Mitts also come in two different sizes, ages 2-4 years and then ages 4+. These mitts typically cost around $42.99 on the Stonz website, but you can use them for multiple years saving the cost of having to put mitts again. You can also purchase the mitts on Amazon at the link below. There are a few other brands that have similar styles, with the long sleeve to keep snow out of the jacket and prevent the mittens from falling off. However, most fall short of having the same functionality and easy of use that Stonz has perfected. Common complaints include cheaper mittens not holding up during snow play and tearing holes near the thumb. Stonz has reinforced stitching to prevent holes and issues along the seams. The mittens also have issues with their level of being waterproof, meaning they are using less quality materials. Another pair of competitor mittens has a similar deign, but the inside fleece isn’t fully attached to the outer waterproofing material. This becomes an issue when taking the mittens on and off, especially in the thumb hole area. Stonz mitts are sewn together as one solid piece, making it easy to slide the thumb in and out without bunching the material. The last competitor is from Columbia, which is a brand that we also own and love. Their mittens are similar in design with a longer sleeve, however they polyester in the interior, minimizing how warm they will be for hours in the snow. They also use elastic without a toggle at both the wrist and upper cuff. We do not feel as though the competitors have as well of a constructed and comfortable snow mitt as Stonz. 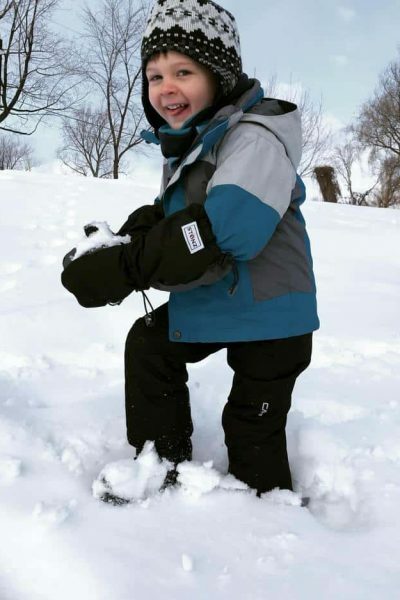 Winter boots are one of the most important parts of snow gear because if your child gets cold feet or the boots won’t stay on, the fun ends pretty quickly. I remember being a new mom looking for snow boots for my one year old son (he is born in November). I asked in a few mom forums and they all recommended Bogs. I ordered a pair and my son’s chubby little feet wouldn’t smash into the boots. Ugh! We ended up just putting him in a rain boots and let’s say that playing out in the snow didn’t last long. Why hadn’t I heard of Stonz? 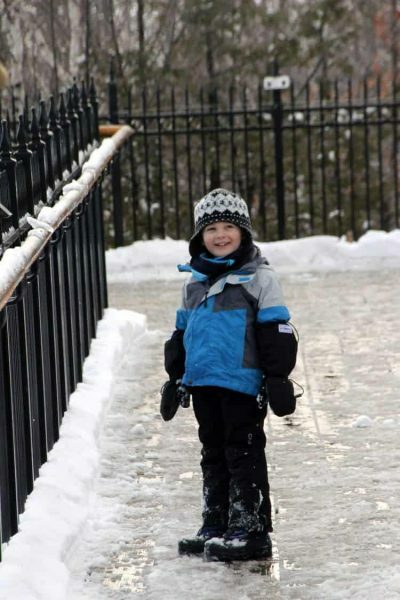 Be sure to check out their cute little snow booties meant for little ones and new walkers. Then I started researching boots for my son’s forest preschool. I stumbled upon a youtube video of Stonz and I immediately fell in love! An easy to put on and lightweight boot with a removable liner? Sign me up! Let me tell you, these boots are so easy to take on and off. My son starting wearing them just before he turned 3. The clips are large and easy enough to operate for most young children, the velcro flaps are also large and easy to pull. The only part I have to help with is the toggles and pull straps. We love the design because the whole front of the boot opens up. My son has large feet for his age (size 13 at age 4), so being able to open the boot wide enough to slide his foot into the liner is key. My son loves these boots! He loves how lightweight they are and how easy they are to climb around with the skid resistant sole with 19x the industry standard for sole abrasion. The boots are rated to be warm in weather up to -50 celsius or -58 fahrenheit. Paired with a weather resistant nylon outer layer and moisture-wicking radiantex liner, your child’s feet will stay nice and warm. 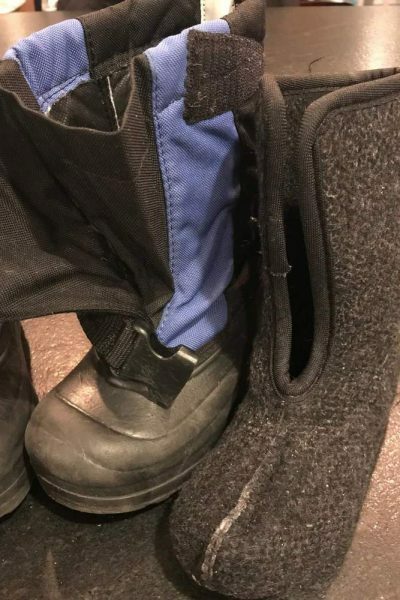 Add in the extra wide opening like I mentioned previously, adjustable buckle at the ankle and drawstring closure at the top of the boot, you can be sure to get the perfect fit. We are all about simple designs with kids gear. We don’t mind a bit of design on kids clothing, but we prefer plain colors and designs on outerwear and footwear. Stonz offers four color varieties in both their Scout winter boots and their Trek Winter boots: Blue, Grey, Pink and Green as an accent color on a black boot. The flaps and buckles stay flush on the side of the boot without sticking out and hindering additional winter clothing. We like how streamlined the boot looks. Stonz only uses high quality materials that are meant to last. The boots are made in Canada with 600D coated nylon and skid resistant soles. The interior liner is removable and is quick drying for repeated use. We’ve owned our first pair of boots and used them for two seasons with daily use, they do not have any holes or signs of wear. We frequently go into the forest to play, even after moving back to the US, so we aren’t just playing in the yard and having snow ball fights. How much do their snow boots cost? There are three different styles of baby snow boots and booties. The Baby and Toddler Booties come in three sizes, 0-9 months (small), 6-18 months (medium) and 1-2.5 years (large). They typically cost around $40- $43, but if you purchased around January/February, you can get them on sale for around $24-$26. You can also purchase the baby booties on Amazon at the link below. Need some baby booties right before Winter? Be sure to join the Stonz community and get 10% off your order. The Winter Boots come in two different styles, the simpler Scout design and the more rugged Trek design. The Stonz Scout Winter Boots range from size 5 – 9 toddler. These boots typically cost around $60 on the Stonz website, but you can find them on sale after the winter for around $30. You can also purchase the boots on Amazon at the link below. The Trek Scout Winter Boots range from size 10 toddler – 3 youth. These boots typically cost around $70 on the Stonz website, but you can find them on sale after the winter for around $35. You can also purchase the Trek Winter boots on Amazon at the link below. There are many options in the kids winter boot department. BRands from Bogs, Columbia, Kamik and many more. It would take a long time to compare each brand to Stonz, so I will cover what Stonz Trek Winter boots have that most of the competitors don’t offer and why their boots are above the competition. We’ve also owned boots from companies like Kamik and Sorrel. These boots are similar in design with a removable wool liners that we are able to take out and dry after hours of use. 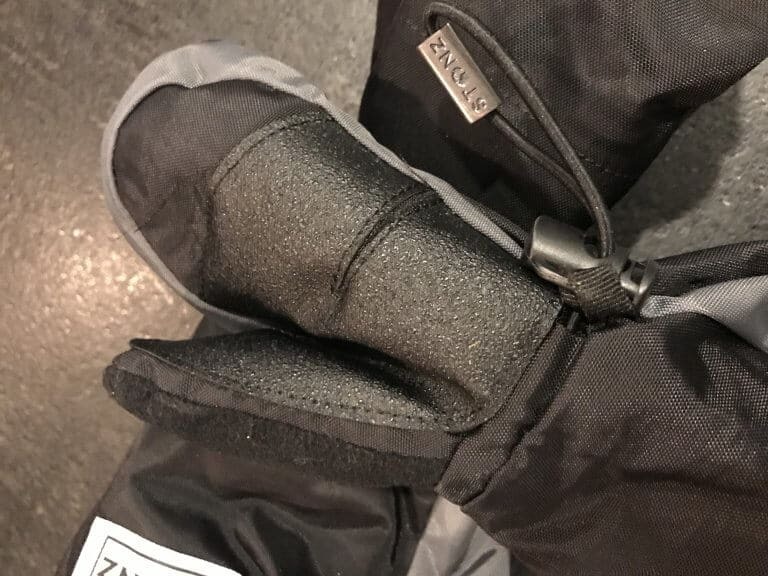 However, they are simple in design, feature a top in opening and the kamik boots have a velcro closure, unlike the Stonz buckle and strap design. The velcro wears over time with repeated uses and eventually doesn’t stick. In addition, the boots can be extremly heavy. Stonz has the lightest boots on the market, which is a huge plus for kids that want to play outside and run! That’s the full review for both the Stonz Mittens and the Stonz Winter boots. I hope this review has been helpful in your decision on what winter gear is best to buy. We continue to purchase Stonz gear as our son gets older. Want to read about all the winter gear and brands we recommend? 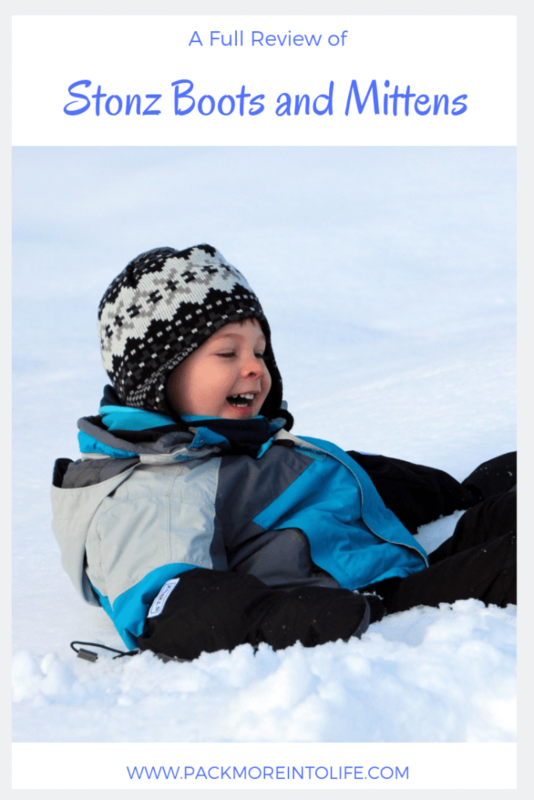 Head over to my winter gear page to read all about dressing kids for the winter weather. Or are you ready to pack up that winter gear and start traveling? Head over to my destinations page to get started. Disclaimer: I contacted Stonz in order to partner with them in exchange for a review of their Youth Mitts, but the opinions expressed in this review are mine and unbiased. I have also purchased all our own Stonz Trek boots, so my opinion of their boots is completely my own. Like this blog post? Pin these images to save them on Pinterest.